While it may not be the official theme of your annual convention, it’s typically the mindset of your attendees. And while you may provide a robust mobile event app to capture all of the sessions and events that will unfold during the event – chances are, your people will be getting just as much use out of a different app. Snapchat continues to be a fan favorite for a selfie-salivating majority and offers fun, creative ways to showcase what’s happening around you. Now, the latest update makes it the perfect addition for the next annual convention. If you look at how the app has evolved with live stories, this new Snapchat search feature is definitely an update to get excited about. It wasn’t that long ago when live stories were only shown for huge national events, like Mardi Gras in New Orleans, or the Super Bowl. Then, we progressed to see live stories for more local, but still large events, like a St. Louis Cardinals baseball game. Now, Snapchat has changed the game by allowing anything and everything to be a searchable live story. To fully understand how your internal events will benefit from using Snapchat, it’s important to learn how this new feature really works, and how your attendees will use it. Before diving into the new aspects of Snapchat, take the time to create a Geofilter – a personalized graphic that can be added to any picture or video taken in Snapchat. It’s as simple as creating a graphic in Photoshop or Illustrator. You could also customize one of Snapchat’s pre-made templates for a more simple solution. No matter which route, you’ll head over to Snapchat’s Geofilter website to create and/or submit the image. This filter will make it easier for Snapchat to recognize what needs to be grouped together, and will make it even more fun! Now that your event can be categorized, it’s time to make sure Snapchat will be able to find all the Snapchats sent out. First, all of your attendees must turn on their location services. This lets Snapchat know all of the content is coming from the same area. Next, tell each participant to click the “Our Story” option when choosing where to send any Snaps. Doing this authorizes Snapchat to post the content on a searchable live story. Once everyone finds the story, the fun can begin – and your brand will start to reap the benefits! We all know attendee engagement is a huge part of successful corporate event planning. Social media plays a large role in this. According to statistics by Freeman XP: Large, signature events create an average of 1,398,359 event-related social media mentions. We’ve already touched on the benefits of Facebook Live, and now Snapchat is making its way to the party. Odds are your attendees are already Snapchatting their experience, so why not leverage this creative engagement tool to showcase brand advocates at your event? If they know their Snaps could be featured on the event’s collective story, participants will likely be more active in capturing and sharing the best parts of the conference to increase their odds of being featured. While this excitement will drive engagement, it also provides the opportunity to save videos and pictures that can be shared later – creating the perfect opportunity for a fun contest down the road that collects the best media from the meeting. Thus, keeping the user-generated content active, even after the event is over. If your internal event features thousands of stakeholders, it can be easy for attendees to feel isolated at some points. They are likely to spend time with the same people, only attend a portion of what the event offers and usually don’t even know what they’re missing. With the new Snapchat search feature, all of that can change by targeting that elusive sense of FOMO, or fear of missing out. At the start of the event, ask your attendees to upload any of their snaps to the previously explained “Our Story” on their Snapchat. Once all their content is in one place, attendees will feel more connected to the event and their fellow attendees. The media will add a fun twist to networking with fun conversation starters – Hey, aren’t you the one from Snapchat that killed it at Karaoke last night? – and may even persuade them to attend more activities or sessions. This is a very useful way to involve your non-attendees at the big event. Why should they miss out on all the fun? The searchability of the story will allow anyone to find it, no matter where they are. Thus, opening the door for them to follow along all weekend, straight from the eyes of their peers. They will feel like they never missed a beat. Now, they are more excited to attend the next event, while still up to date on what happened at the recent event. What to do next is in your hands. Leveraging social media is a can’t-miss for any event, so take advantage of these simple ways to take your event to the next level. Get out there and show all your stakeholders how much fun it is to actively engage at an event – and get some great content for future use! Snapchat isn’t the only way to keep attendees actively involved in your event. 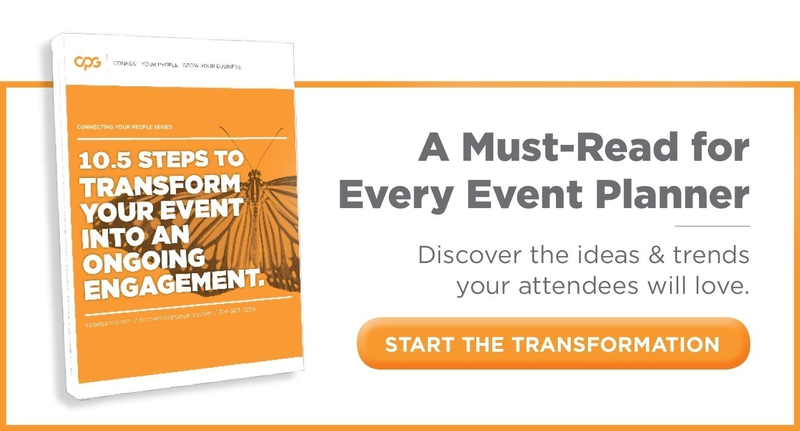 Take a scroll through our event engagement eBook and discover more ways to transform your next event.